Tylenol PM | Does Tylenol PM Work | Is Tylenol PM Safe? There are many things that can keep you lying awake at night when you are supposed to be sleeping. Sometimes stress, anxiety, and common worries can distract you from counting sheep and falling into a deep, restful slumber. But sometimes, physical pain can prevent you from getting the restorative night's rest that you deserve. In such circumstances, the manufacturers of Tylenol PM hope that you will turn to their over-the-counter sleep aid in order to get to sleep at night. But is this really the best solution? Our sleep supplement research experts have a healthy skepticism of these claims. So they decided to look into Tylenol PM and whether or not it is the best sleep aid. The information they found out may surprise you. Keep on reading if you would like to know more. 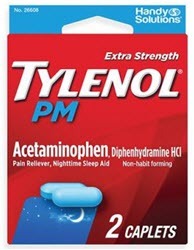 There are two main ingredients of Tylenol PM: acetaminophen, and diphenhydramine. One is an analgesic, and the other one is actually an anti-allergy medication which has the known side effect of making people feel sleepy. Together, these ingredients serve the dual purpose of helping you fall asleep, and relieving nighttime pain. Another name for acetaminophen is Paracetamol. it is known as an analgesic, which is the fancy science word for pain reliever. Because it is available over-the-counter, it is generally only used for mild to moderate pain relief. Some prescription pain relievers also incorporate paracetamol into their formula, but in very high doses. Acetaminophen is also occasionally used for fever reduction, especially in young children, despite the fact that scientific evidence does not show that it is generally effective for this purpose. Another important thing to know about acetaminophen is how it can detrimentally affect your liver. Taking acetaminophen in high doses, especially on a frequent basis, is extremely bad for your liver. In some cases, people who have taken high doses of acetaminophen for long periods of time can experience liver failure and even death. So if you have frequent pain, or you have issues with the health of your liver, you should be extremely cautious when taking this medication. Diphenhydramine also comes with serious health consequences, especially if you take it frequently. Recent scientific studies have associated long term diphenhydramine use with dementia in elderly individuals. It's hard to say whether or not Tylenol PM has any real benefits. If you are only using it occasionally and sporadically, as the manufacturer recommends, then there may be some benefits to taking Tylenol PM at bedtime. This is especially true if you suffer from aches and pains that keep you from being able to fall asleep at night. However, if you feel like you have to take Tylenol PM on a regular basis, especially for sleeplessness and/or pain alleviation, there's a chance you may be doing more harm than good in the long term. Too much acetaminophen is bad for your liver, and too much diphenhydramine is bad for your brain and nervous system. Abusing these drugs over the course of several weeks, months, or years can lead to long-term health consequences which will both shorten your lifespan and detrimentally affect your quality of life. Even those who have left reviews on the official Tylenol PM website do not seem to think that this particular drug has any substantial benefits at all. Many customers complain of purchasing expired or otherwise ineffective Tylenol PM tablets on Amazon. Furthermore, many of the negative reviews of this product complain that it causes symptoms such as dizziness, nausea, and even restless leg syndrome. So other than the negative side effects of both paracetamol and diphenhydramine, this particular sleep medication can have additional medical side effects that may not be as obvious as you would think. Any sleep medication that includes diphenhydramine will help you fall asleep; but it can become a problem when the quality of your sleep is adversely affected by certain sleeping pills. The best way to get the restorative rest that you need is to fall asleep in the most natural way possible. Sleep medications like Tylenol PM, however, do not allow for natural sleep to happen. When this is the case, it can have many detrimental side effects that are not readily apparent. If you have to rely on a pharmaceutical drug in order to get to sleep, you will likely spend more time in the shallow part of your sleep cycle and spend less time in the deeper, more restorative sections of said sleep cycle. If you spend less time in restorative sleep, your body will not be able to repair itself from regular daily environmental damage. It will also not be able to clear out the toxins from your body. These are all important processes that happen when you sleep at night. They are also essential for good health and longevity. Spending less time in restorative sleep is a major cause of premature aging, lower life expectancy, and serious health afflictions such as dementia. Purchasing Tylenol PM is both easy and relatively affordable. You can purchase a box or a bottle of pills at any drugstore or supermarket in your immediate area. Depending on where you make your purchase, you can get Tylenol PM for anywhere from $0.05 per pill to $0.12 per pill. But you have to ask yourself the following question: is it really worth it? We've discussed already the potential health consequences from taking this medication too often. Between the potential for liver disease and the potential negative effects on your brain and your nervous system, taking Tylenol PM on a regular basis could do much more harm than good. Are you sure you want to put your health at risk like that? Now that you know the facts, most people would quickly answer "no". But don't worry; you have safe and healthy alternatives when it comes to supplements that can help you get good sleep at night. And we'll be happy to show you on our reviews page.